Bookerville and MyBookingPal: Get Started Today! Fully-integrated channel management, all within your Bookerville dashboard. 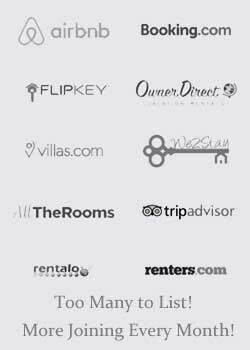 MyBookingPal is a global channel manager featuring direct integration with over 40 vacation rental listing sites, portals, and travel agencies. Choose the channels with whom you want to participate. You can even choose to participate only during certain parts of the year, like your low season for example. No setup fees, no annual or monthly fees. Commission-based. Commission amounts vary, depending on which channel(s) you choose to use. "Net Rates" feature: choose to only accept bookings if the channel can get a high enough rate to cover their commission. Risk-Free! No additional Bookerville or MyBookingPal fees. Data integration - property features & amenities, rates, taxes, minimum-stay rules, and even photos can be "pushed" to channels from your Bookerville account.